My website is growing so quickly! A lot of the items that I ordered in January at AmericasMart Atlanta have arrived and are up for sale now. As I mentioned a few weeks ago, I now have licensed pieces by Folk Artists Nicol Sayre, Sharon Andrews and Heather Myers. These are perfect for Spring and Easter, and are currently 15% off my already low prices by using the code BUNNY during check out. I will soon be adding a couple of Patriotic designs and, eventually, designs for Halloween. And don’t forget about Elaine Roesle and her Snow Children and St Nicholas. She’s a wonderful artist and person- and only lives about 10 minutes away from me! The jewelry section has exploded! In addition to the new designs by Art by Amy, my collect of John Wind Maximal Art has doubled and also includes designs in silver! He has a new Country Living collection as well. There are currently 3 designs from that line available in my store and a few more that can be pre-ordered. I can’t wait to get the rest of the pieces in stock, they are really awesome! Also new this year is jewelry from Debbee Thibault. She has been creating wonderful Folk Art since 1985, and I am lucky to be able to offer some of her jewelry. There will soon be some special pieces added, so keep watching for them. Another unique line is Lola Rae by Michele Muska. 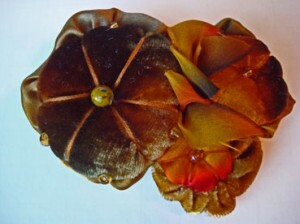 Michele uses ribbon and cloth to create pincushion jewelry. 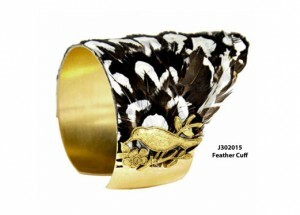 You will find necklaces, bracelets and brooches that are sure to get you noticed. Still on order from the show in Atlanta is a new line from K&K. I will post a few photo to their page in the store so you can get a feel for what will be offered. A couple of the items will be perfect for Halloween. 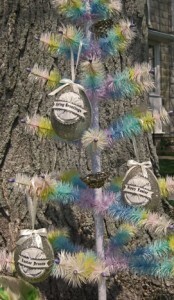 The Easter Feather Tree that I was sharing with you is now complete and on it’s way to Utah. You can see a picture of it on the front page of my store. After getting the rest of the items added, and getting some work done in the yard, I will be starting on an order for a fall-colored Feather Tree. Also, I am planning to have a booth at the Farmers Market in Piqua starting at the end of May. I think I’d better get working on some things for that too. I hope everyone is having a wonderful Spring. Thanks for stopping by!